Jennifer Serravallo calls herself a “dedicated reading and writing workshop teacher.” As any dedicated reading and writing workshop teacher will tell you, teaching in this fashion is both tremendously rewarding and damned hard work. In her new book, The Writing Strategies Book, Serravallo has given the hard-working literacy teacher just the kind of help she needs. 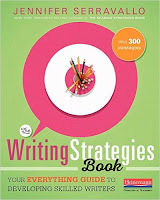 The Writing Strategies Book is a companion book to The Reading Strategies Book, which Serravallo released two years ago and which I reviewed here. Like the earlier book, The Writing Strategies Book has Serravallo’s characteristically thoughtful organization, grounding in research, and helpful format. Whatever your concern about the needs of a particular writer or group of writers in grades K-8, you are likely to find assistance here. The book is organized around ten goals, arranged in a loose hierarchy. Serravallo’s view (reflecting Hattie’s research) is that the skillful writing teacher assists students to articulate a goal and then provides strategies and feedback to help them achieve that goal. The ten goals are composing with pictures, engagement, generating ideas, focus, organization/structure, elaboration, word choice, conventions, and partnerships and clubs. These goals are then arranged in such a way to allow teachers to pick and choose appropriately for students at different levels of writing development. Each chapter introduces the goal and suggests how to know if the teacher is choosing the right goal for a particular writing student. The chapters also contain dozens of strategies to help the harried teacher meet the individual needs of students at varying levels of control of the writing process. These strategy sheets, similar to those in Serravallo’s previous book, are little masterpieces of design to help the teacher use them efficiently and effectively. Each strategy sheet tells you for whom the strategy is designed (grade levels, genre, processes) and contains an explanation of the strategy, teaching tips, prompts to use with the writer, and a Hat Tip that provides the interested reader with a place to look for further reading on the topic. Speaking of the strategies approach to teaching writing, Serravallo says "Strategies help to take something that proficient writers do naturally and without conscious effort, and make it visible, clear, doable for the student writer. The strategies addressed are many and varied. Here is a sampling. It is a daunting array of strategies, but fortunately Serravallo provides an introductory chapter, Getting Started, that clearly explains how to use the book and provides a great many suggestions for setting up a writing workshop in the classroom. Whether you are new to writing workshop, or a writing workshop veteran, you will want to start here to learn how to use the book most effectively and for the suggestions for setting up the classroom. The Writer Strategies Book is true to its subtitle, Your Everything Guide to Developing Skilled Writers. It belongs on your desk right next to your plan book to provide a helping hand as you work to help children become skillful and willing writers. Serravallo, Jennifer. (2017). The Writing Strategies Book: Your Everything Guide to Developing Skilled Writers. Portsmouth, NH: Heinemann. Beyond Grades: How is My Child Doing?